Most of the time, when you’re looking at a drawing or model of Euoplocephalus, what you’re really mostly looking at is NHMUK R5161. This specimen preserves a large amount of intact skin, which means that the free-floating osteoderms are, for the most part, in their correct life positions. Osteoderms form in the dermis of the skin, and so osteoderms are usually found as isolated elements, or scattered around disarticulated or associated skeletons. Because NHMUK R5161 is so complete, it has formed the basis for most restorations of Euoplocephalus. Yup, all of these are kind of Scolosaurus. Especially the pink one. 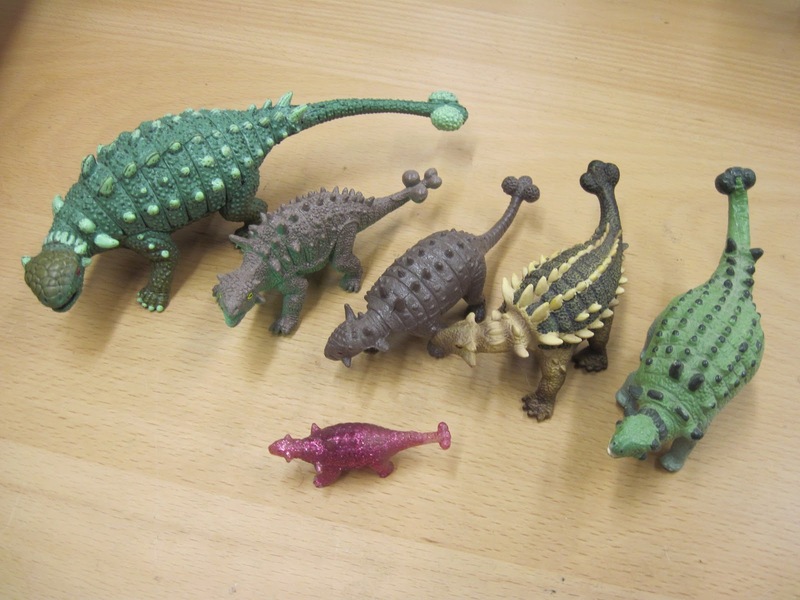 Perhaps somewhat embarassingly, this does not represent my complete collection of ankylosaur ‘scientific models’. However, you may have noticed something important: Scolosaurus lacks a skull and tail club. So, how could I figure out if Scolosaurus was the same as Euoplocephalus, if I couldn’t look at the patterns of cranial ornamentation? If you remember back to part 2 of this series, I said that the morphology of the first cervical half ring was useful for diagnosing Euoplocephalus. This reconstruction of Scolosaurus was drawn by Alice Woodward based on NHMUK R5161, and I suspect that many subsequent images of Scolosaurus were inspired by Woodward’s art. The collection of NHMUK R5161 is one of the more interesting stories of palaeontological collecting in Alberta. The specimen was discovered and primarily excavated by William Edward Cutler in 1914, working for the Calgary Syndicate for Prehistoric Research (an excellent name for an organization that is, sadly, defunct). During excavation, the ankylosaur block collapsed on Cutler, no doubt causing grievous injuries. 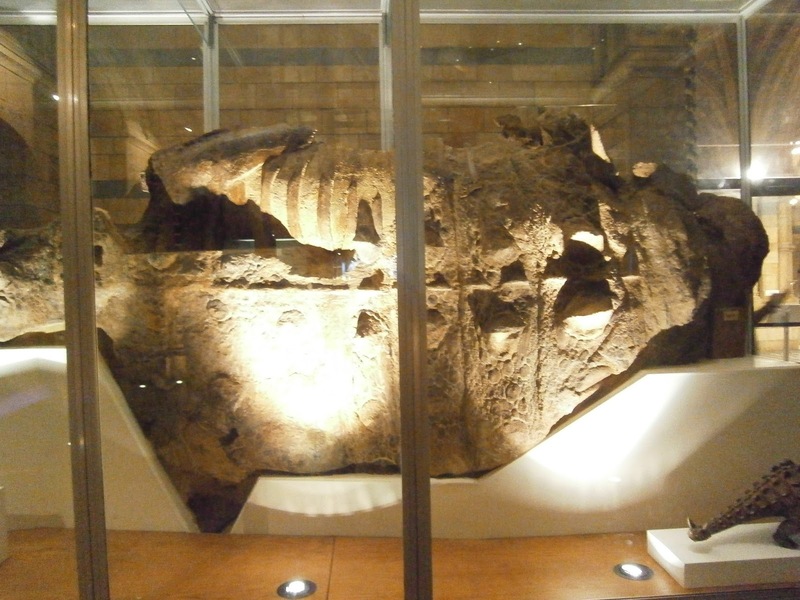 One of the Sternbergs finished the excavation, and the specimen was shipped to London. NHMUK R5161 is significant, beyond being so complete, because it may derive from the Oldman Formation of Dinosaur Provincial Park, rather than the Dinosaur Park Formation. The quarry is somewhere across the river from Happy Jack’s, the University of Alberta’s field camp since 2008. However, the precise locality of the quarry is somewhat up for debate, and Oldman Formation sediments crop out in this area. Next week I’ll be heading to Dinosaur Provincial Park, and one of the goals is to check out some of the potential quarry locations with our crew from the UofA, as well as Darren Tanke from the Tyrrell Museum, who has been investigating the NHMUK R5161 quarry for some time. It’s important to know whether or not Scolosaurus comes from the Oldman or Dinosaur Park formation, so we can know whether or not Scolosaurus lived at the same time as Euoplocephalus. We will also be on the lookout for any leftover material…like the skull and tail club. Two Medicine Formation skulls, from Arbour and Currie (2013). Notice the long, curved squamosal horns. For a long time I was bitterly disappointed that there was no skull known for Scolosaurus. Could some of the isolated skulls I was referring to Euoplocephalus instead belong to Scolosaurus? 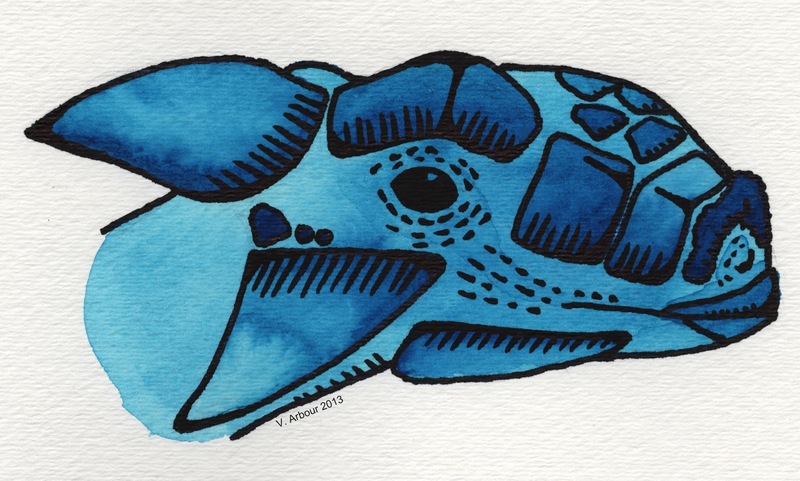 Or was the skull of Scolosaurus noticeably different from Euoplocephalus? I despaired that I wouldn’t have an answer to that question unless we miraculously collected another Scolosaurus from Dinosaur Park during my thesis. In the meantime, I was trying to figure out the identities of “Euoplocephalus” specimens from the Two Medicine Formation of Montana, which seemed very different from the Albertan specimens. These skulls had much longer and pointier squamosal horns with a ‘backswept’ appearance compared to Euoplocephalus and Anodontosaurus. I thought perhaps that the Two Medicine ankylosaurids might represent a new species of ankylosaurid (as did others – Penkalski named Oohkotokia earlier this year based on MOR 433, which has this unusual squamosal horn morphology). From left to right, the first cervical half rings of AMNH 5337, TMP 2001.42.9, USNM 7943, and NHMUK R5161. The top row shows the half rings in anterior or posterior view, and the bottom row shows the rings in dorsal view. NHMUK R5161 is in dorsal view. Modified from Arbour and Currie (2013). One day I was flipping through my photos of the Two Medicine Formation specimens when I realized that the morphology of the first cervical half ring of TMP 2001.42.9, the only specimen that had a half ring and skull, matched that of NHMUK R5161. Both had flat medial osteoderms with a central bump, rather than a keel. And indeed, another isolated half ring from the Two Medicine formation had this morphology as well. Scolosaurus was present in Montana! I’ll just take a moment here to address Oohkotokia: while I agree with Penkalski (2013) that the Two Medicine Formation ankylosaurid differs from Euoplocephalus, I do not think it differs sufficiently from Scolosaurus for these to be considered separate species. Perhaps one day in the future we’ll find another Scolosaurus from Dinosaur Park that has flat medial osteoderms on the cervical half ring, but a skull with different squamosal horns compared to the Two Medicine skulls. If that happens, then I think you could make the case that Oohkotokia is valid. Until then, Oohkotokia is a junior synonym of Scolosaurus. Next time: wrapping up loose ends, and figuring out what it all means. Arbour VM, Currie PJ. 2013. Euoplocephalus tutus and the diversity of ankylosaurid dinosaurs from the Late Cretaceous of Alberta, Canada, and Montana, USA. PLOS ONE 8:e62421. Nopcsa BF. 1928. Palaeontological notes on reptiles. V. On the skull of the Upper Cretaceous dinosaur Euoplocephalus. Geologica Hungarica, Series Palaeontologica 1:1-84. Penkalski P, Blows WT. 2013. Scolosaurus cutleri (Ornithischia: Ankylosauria) from the Upper Cretaceous Dinosaur Park Formation of Alberta, Canada. Canadian Journal of Earth Sciences 50:171-182. Penkalski P. 2013. A new ankylosaurid from the Late Cretaceous Two Medicine Formation of Montana, USA. Acta Palaeontologica Polonica, in press. ← Who-oplocephalus: Heads for Tails. Regardless of whether Scolosaurus is from the Oldman or not, if it is present in the upper Two Med, it was definitely coeval with Euoplocephalus (except perhaps, when it first appeared). Strangely, the strat. column suggests Scolosaurus disappeared in Alberta early in Dino Park time, only to reappear in Montana during or after the heyday of E. tutus (or before the bearpaw). Unfortunately, because Penkalski's taxonomy is unpublished, his nomenclature is not “available” to compete for synonymy. It is not good to synonymize taxonomy when that nomenclature is technically unpublished, even if it is “in press.” While you have data that points to the specimens being comparable, the fact is without publication the taxonomy cannot be synonymized. The availability of the digital version of a paper that presents new taxonomic nomenclature is problematic when the same journal only affords the paper version authority in dating availability of that nomenclature, as is the case with APP: because of this, “Oohkotokia horneri” will only be available beginning with the print publication, and at no time earlier. Starman – Yup, you're interpreting the strat column correctly. Based on the specimens we have, Scolosaurus is present only in the lowest Dinosaur Park Formation (or possibly the Oldman Formation) within Alberta. In the paper, I discuss how this could possibly reflect environmental changes; perhaps Scolosaurus and Euoplocephalus generally occupied slightly different habitats. Alternately, the Two Medicine and Oldman/lowest DPF ankylosaurids are not the same taxon. Jaime: There's an explicit statement in Penkalski's paper saying that the name is available in the electronic version of the manuscript, and Oohkotokia has been registered with ZooBank with a date of 2013 (http://zoobank.org/NomenclaturalActs/EE0FA729-37AB-4C59-B319-CDE66770A36A). I agree that 'accepted manuscripts' with new taxonomic names are pretty confusing for figuring out publication dates and availability. I would much prefer that either the ICZN clarifies how to handle cases like that, or that accepted manuscripts with new names not be published online before the 'formal', final version of the paper. It would have been super weird to not discuss Oohkotokia given that I was reviewing the taxonomy of Euoplocephalus and its synonyms, and everyone can see Penkalski's paper and read it. One thing that just occurred to me: The Two Medicine represents an upland area, farther inland than the coastal lowlands represented in the Oldman and Dinosaur Park. Could the holotype of Scolosaurus, the only specimen found outside the Two Medicine, have initially died in the highlands, wound up in a river, and been carried downstream to be buried in the lower floodplains?